With the red lamp-shades glowing, the village hall had taken on the atmosphere of a bar in the Deep South as a back-drop to the fascinating and insightful talk by Paul Oliver on Friday, May 8th on the development of blues music in the United States and the musicians who played and sang this style of music. Paul, who lives in Wootton, has broadcast for 50 years on the subject on BBC radio, as well as writing twelve books so far, and it was clear that we were in the presence of a world authority in his field. What made the evening so compelling was that Paul himself had taken the photographs and made field-recordings of the musicians, sometimes in the street but also in unlikely locations like a barber's shop, where one artist cut people's hair for a living and provided a backing rhythm using a razor-blade on a leather strap. Indeed, one image from this shop summed up the tragedy of segregation in the Deep South - that Paul had his hair cut, but the owner swiftly swept it up so that a white man's straight hair would not be seen next on the floor next to that of black men. Punishment, even as recently as the 1960s, could be jail for such a violation of the segregation laws in the region. 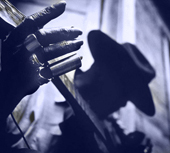 Some of the most evocative interviews featured men explaining how playing the blues often helped ease the pain of poverty and hopelessness in their lives, with the music touching nerves and providing a soothing balm. Such a release took many forms and Paul explained the different techniques and styles within blues music, including the occsional ingenious use of an aspirin bottle to provide the "sliding" sound whist playing the guitar. Many of the musicians had other jobs as well as playing the blues, such as scrapping cars or even taking discarded furniture from affluent white areas of cities back to impoverished black areas, where it was sold for a few cents. However, some were full-time performers and often played all night in various bars, only stopping when dawn finally broke. It was easy to see how Paul's research down the years has been so influential and prompted interest around the world in many foms of African-American music. His expertise was delivered in such a way that it was clear hat he sympathised deeply with the musicians and their plight - and how he was so moved at their way of overcoming acute deprivation. His interest had first developed during the war when he was posted to Suffolk and heard some of the black servicemen singing so powerfully whilst digging trenches around an American air-base. He was determined to trace the origins of such "hollering" and this sparked a passion which started with the publication of his first article in 1951 and still burns strongly today. 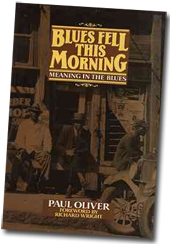 As a gifted illustrator, Paul has also designed many covers for books, as well as for iconic blues and jazz albums and his well-received biography of Bessie Smith, the legendary blues singer of the 1920s, led to a magisterial study of the meaning of the blues, called Blues Fell This Morning. This book proved so impressive that Paul was awarded a scholarship to travel to the Deep South with his wife, Valerie, and to make those iconic field-recordings which gave such pleasure to those of us in the village hall on a warm spring evening. Paul is also editor of the Encyclopaedia of Vernacular Architecture of the World, running to over 2,500 pages and covering three volumes, with researchers in 80 countries. Paul has 30,000 slides of buildings that he himelf has photographed and we are pleased he has agreed to give a further talk on the subject in the future. 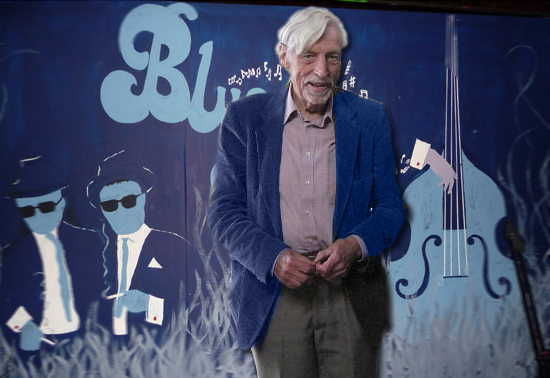 Those who remember Tommy Steele’s “Singin’ the Blues” may know that the blues are connected with loss or sadness. After all, he had lost his lover. Until today, if asked for a definition, I would have said: “soulful stuff from America”. That’s not too far from the truth, but, thankfully, Paul has put the words and music of the blues into context. An excellent and enjoyable evening, because he spoke in words of one syllable and avoided technical terms. Also, because he gave a very personal story of his work and of his meeting with blues musicians, including some significant recordings. And, not least, he covered the background, speaking of the political and social isolation, the poverty of the American black community until quite recently, and the need to retain something of their cultural heritage. He spoke vividly of the fact that, when being driven around in the US, his wife had to lie on the floor of the car covered by a blanket, because the black driver would have been shot for having a white woman in his car. Sadly, the blues are no longer a living part of the musical scene, but Paul left me wishing I had listened to them more and appreciated the message. A splendid talk - Rev. Stephen Jones, Wootton.